I don’t remember the last time that I made muffins “from a box.” And I’m afraid if I tried muffins from a box, I wouldn’t like them. They may be extra sweet…but I’m afraid they wouldn’t taste real. Or good even. Since I gave up processed sugar and white flours this month, I’ve had to get creative with baking. I did get some wheat berries and sucanat to help make some sweeter treats that didn’t have white flour or sugar involved. And I thought adding a crumb topping would be helpful since sucanat isn’t quite as sweet as sugar. 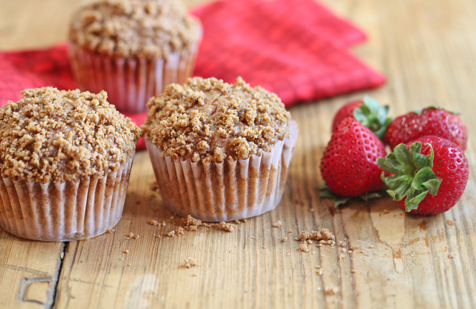 The sweet crumb topping was a perfect addition to these muffins. I did not think the kids would like them because they were made with all whole wheat flour (I’ve generally made muffins with half white and half wheat flour). I thought the density and thickness of the muffins from being made with all whole wheat would be a turn off. Well, let me tell you…there were none left to freeze! Between afternoon snack and being requested again that night for dessert, these guys didn’t even have a chance to get into the freezer. Preheat oven to 350. Grease 12 muffin tins or line with paper cups. In a large stand mixer or mixing bowl, beat together the bananas, sucanat, egg, oil and applesauce. Beat in the whole wheat flour, baking powder, baking soda and salt. Gently fold in 1 cup of mashed strawberries. In a small mixing bowl, add the whole wheat flour, cinnamon and sucanat. Cut in the butter with fork or pastry blender. Pour the batter into the greased muffin tin and then divide the topping evenly. Bake in the preheated oven for 18 to 22 minutes, or until toothpick comes out clean. What is sucanat and where do you get it? It’s a sugar alternative that is thought to have less of an impact on your blood sugar (has a lower glycemic index) It is very coarse…I’ve found that it works best for muffins…doesn’t do well in cookies because it is so course. You can find it on Amazon or at a health food store near you. Let’s say you didn’t care too terribly much about 3/4 cup of sugar in muffins because you really want these muffins now and don’t want to go find sucanat. Could you use regular or brown sugar instead or is there something specific about the sucanat? Yes you can use brown sugar instead of sucanat – which is actually just a less refined form of sugar. Sucanat is sugar, just not as refined as white baking sugar. Wow these look so good! Add a perfect cup of tea, and it sounds like the best breakfast ever! Might try them with blueberries too… yum! You wrote no sugar in these muffins sucanat is sugar. It’s a sugar substitute that is much lower on the glycemic index. It’s what I will be using for making muffins to reduce the effect on the blood sugar. Thank you so much for posting this recipe! I didn’t realize Sucanat was an alternative to sugar. We’ve been using agave nectar for almost 2 months, I will have to look into getting Sucanat when I go grocery shopping. I hope they have it at whole foods…I don’t remember seeing it, but I haven’t been looking either. If I can’t find it do you think I can substitute honey or agave? These were absolutely delish! I think I have to reduce the amount of sugar next time though. (Used my last bit of sucanat last month and haven’t made it to the whole foods market.) I think it will be sweet enough with the mashed banana, to be honest. Awesome Yazmin…let me know how they turn out without any sugar…you might be right about the banana! I made these this morning exactly as in the recipe (foundthe sucanat easily at our local health food store – Nature’s Oasis – in bulk). They were absolutely delicious and I will definitely put this rccipe in my Keeper’s File. I made these yesterday for my kids for snacks at school. I used whole sugar but cut it down to a little less than 1/2 cup and cut all the oil. They were VERY moist, but the kids loved them! I’m a bit confused to the serving size, at the top it says, yields 4 servings but at the bottom it says makes 12 muffins. I would assume that 1 muffin is a serving, correct? I use barley flour for pancakes, muffins and quick breads. Barley flour is so delicious! And very nutritious too. I use it for most of my baking and would never go back to whole wheat flour. It doesn’t work well for bread recipes with yeast. What could I use as a substitute for the applesauce? I have an apple intolerance. I plan to try making pearsauce soon, but as of yet have not mastered it and don’t know how readily available it is. Thanks! Looks yummy but sucanat is sugar. It taste just like the white stuff when you bake with it. You might like palm or coconut sweetner. I use unpasturized honey in recipes. For every 1 cup of sugar called for I subs with 2/3 cup honey and lessen the the liquids called for. Just an idea. Sheri have you tried pear sauce? These were absolutely delicious! I love the fresh fruit ingredients. The only problem I had was with the “crumb” (or “not so crumb and more like mushy glaze”) topping. What do you think I did wrong? I did use brown sugar instead of sucanat but I didn’t think that would make a big difference? Our little one has Juvenile Diabetes so… always looking for low glycemic non-artificial sweeteners. I just made a batch of banana muffins which had four bananas and a half cup of sugar and it was plenty sweet enough. I have heard you can substitute honey and only need half as much honey as sugar as a half cup honey is as sweet as one cup of sugar. The banana muffins still not really healthy for those watching blood sugars as it is the amount of carbohydrate that also counts. Each banana has 15 grams carbs at least. For those it is not strictly necessary to count carbs or watch blood sugars, this is certainly a more healthy recipe. But these would still taste good if you reduce the sugar or succanat to half a cup. 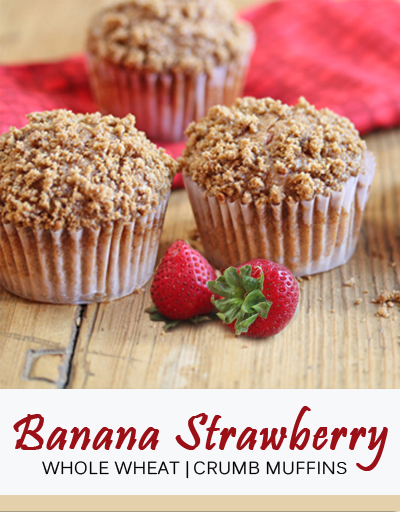 Where can I find the nutrition information for these muffins ? I usually copy and paste recipes into http://caloriecount.about.com/cc/recipe_analysis.php. I made these this morning. I used 1/2 c brown sugar and only the 1/4 c applesauce skipping the oil. I ended up with 16 muffins and had to skip the crumb topping because I had no butter out. THAT is a very rare thing around here. I HATE hard butter and usually keep on top of making sure it’s out. Unfortunately, they don’t taste very strawberry but that’s probably because I used up some old frozen ones! i made these tonight and the middle is complete mush- they have baked about 40 min now. I don’t know what I did wrong. Followed recipe- would electric oven make difference? I am not a baker!